In order for any automaker to record sales gains consistently, they need to introduce new products that buyers will get excited about. Subaru has announced record global sales in their major markets in the U.S., Canada and Australia. 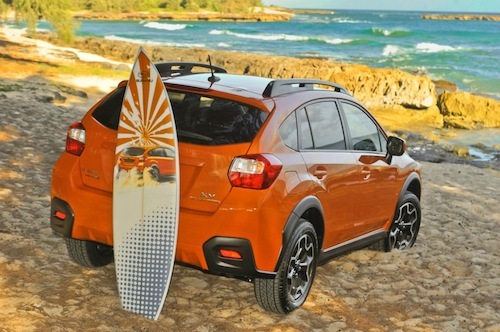 They have done it with the very successful launches of the all-new 2013 XV Crosstrek and 2013 BRZ sport coupe. But how does the seemingly small automaker from Japan keep putting out new and innovative cars that buyers are flocking to? Fuji Heavy Industries Ltd., the maker of Subaru automobiles, is a successful company who also has an aerospace division who makes parts for Boeing, helicopters, aviation business jets and industrial power products. They also have an Eco Technology Division that manufactures garbage trucks, robot sweepers and wind turbines. What makes FHI so successful, is the fact that they share technological advancements with each other, which leads to Subaru cars that have a great deal of aircraft technology. The best example is their revolutionary horizontally opposed boxer engine which applies this technology. We see additional technology in Subaru automobiles that allows the claim of having top safety picks from the IIHS across their entire product line, a distinction no other manufacturer can claim. Consumer reports rates Subaru cars above Mercedes-Benz, BMW, and every other manufacturer in performance, comfort, utility, and reliability, and says the company makes the best cars in America. And ALG (formerly Automotive Lease Guide), the industry's arbiter of residual value and used-car prices, named Subaru the leader in retained value among mainstream brands. So when FHI announces that Subaru has marked the best sales year ever across the globe, it shouldn’t come as a surprise. The seemingly small automaker from Japan has backing and technology that other automakers don’t enjoy. That’s how they can develop new cars like the 2013 XV Crosstrek and Subaru BRZ that have been wildly successful since their launch last year. The all-new 2014 Forester will also see immediate success globally with its new technological innovations. In the US, Subaru marked its best sales year ever with 336,441 units in 2012 as well as its best-ever sales month in December 2012. In addition, Subaru set all-time sales records for the fourth consecutive year. The sales record for 2012 also means that Subaru is the only manufacturer in the US to have posted five successive years of sales growth. The new Impreza marked the biggest sales gain with 68,175 units (up 148.9% from 2011). The newly introduced 2013 XV Crosstrek and BRZ have contributed in a big way with 4,144 units and 7,396 units respectively. In Canada, record-high annual sales are marked with 31,003 units (up 14.9% from 2011) led by the strong sales of the Impreza, the newly introduced Subaru XV and steady sales of the Outback. In Australia, Subaru also achieved record sales of 40,189 units (up 18.2% from 2011) in 2012 with strong sales (9,908 units) of the Subaru XV launched in January 2012. As it looks from the outside, Subaru shouldn’t be doing as well as they are. But Subaru doesn’t have limited resources. They have an industry leader in Fuji Heavy Industries that has the resources and technology that ends up in their Subaru automobiles. So when buyers sit behind the wheel of that new 2013 Subaru XV Crosstrek, BRZ and 2014 Forester, they should know it has the latest technology advancements from many industries.